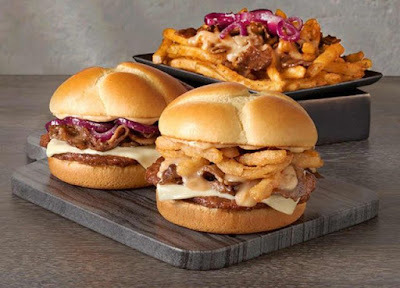 Checkers and Rally's offers three $2 menu items featuring Philly steak for their new, limited-time Feastival of Steak. - French Onion Steak Burger - A grilled beef patty, Swiss cheese, Philly steak, French onion sauce, and crispy onion tanglers, on a glazed Kaiser bun. - Philly Cheesesteak Burger - A grilled beef patty, Swiss cheese, Philly steak, grilled onions, and Montreal mayo, served on a glazed Kaiser bun. - Steak Loaded Fries - The chains' signature Famous Seasoned Fries topped with Philly steak, French onion sauce, and grilled onions.